I’ve been listening to the fringes of talk radio for years. The people running the media companies that distribute these shows usually don’t listen. If they did they would be appalled. The hosts often say things that would never be allowed if that host worked in that company’s office. What would get someone fired for sexual harassment or bigotry is classified, “entertainment” since supposedly off the air the hosts follow the corporate HR guidelines and their words or actions are different. How should a corporation act when the hosts both violate and mock a company’s policies about bringing firearms into the company’s office? Did your HR people give them permission to violate your policies? Have other employees been advised of guns in the office? Do other employees have any rights to safe working conditions? Have people who work in the same building as the radio studio been advised of firearms in the building? Do workers in surrounding offices have a right to know that some people either got a waiver to bring firearms into the building, or that there were/are no consequences for firearm violations? Does the building management have a no firearms clause in their lease? Have they been alerted that it is being violated? Are there any consequences for violation of the lease? Have the insurance companies who cover the liability of the corporation been alerted? Do they want to re-evaluate the premiums that the corporation is paying? It’s been a week and HQ has not responded to my calls and letter, so I’m posting it here publicly. I’ll let you know if they respond. Do you know that two of your radio hosts bring loaded firearms into your studios? Please listen to the following clip of hosts Mark Walters and his producer/sidekick Sean Young aka “Seanto” LINK. They talk about ignoring signs saying “no food and drink in the studio” and ignoring signs that say “no guns.” To determine if they actually had guns in the studio, I contacted Mike Moran, the general manager at your Atlanta studio from which Walters was broadcasting on Sunday, January 25. Moran spoke to Walters who confirmed that he had in fact brought firearms into the studio that day. 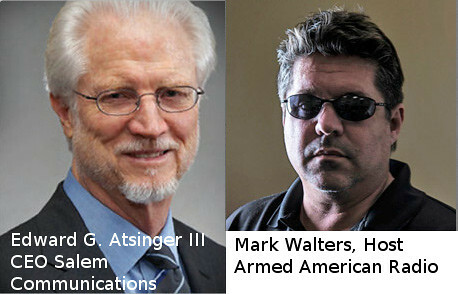 Additionally, Walters admitted to the GM he had brought firearms into the studio(s) in the past. I haven’t yet confirmed if Young was also carrying that day, however I am copying John Peroyea, VP of Operations & GM for your Dallas/Ft. Worth station on this letter. He may be able to determine when and how often Young carried while in your Dallas studios. Moran believes Salem has a strict policy that does not permit employees, independent contractors, customers and/or their guests to bring weapons onto your premises. Can you confirm this, and does the policy apply to your properties and leased studios nationwide? I attempted to get a copy of your firearms policies but neither Christopher Henderson, your VP of Legal and HR, General Counsel and Corporate Secretary nor Russel Shubin, Director of your National News and Public Affairs responded. The reason I want to know your policies on firearms is because many of your company’s hosts and our nation are engaging in a national discussion on public safety. Specifically we are looking at the causes of, and solutions for, violent gun deaths. As a leader in the Christian and conservative communities, your corporate policies on this issue and how you respond to people violating your own policies regarding firearms is important. Moran told me that Walters assured him that he won’t bring his firearms to the studio again, however, I wonder about the reliability of someone who has flagrantly disregarded your rules in the past and who ends every show with, “Carry on, carry off, carry everywhere. NEVER leave your cave without your club.” Can Walters be trusted to put the safety of others and compliance with your policies ahead of his own “carry everywhere” brand? I’m not sure why your staff didn’t respond to my questions or why your policies aren’t published on your website. Perhaps you consider it a private internal matter, however, considering you are the co-creator of the petition site Support Second Amendment which you and your SRN hosts plan to present to congress, I think the public has a right to know your views on firearms in your own offices and studios. I know you can’t oversee all your employees or contractors who rent out your studios, that’s why you set up policies. I look forward to hearing back from you or your staff.